Perhaps, among the owners of iPhone few of those who do not go out with him in the Internet, because this gadget just made for surfing the web. However, after purchase, you may find that to access the Internet you need to complete the setup of the iPhone. To make it easy. First, open "Settings", select "General" then "Network" and enter operator details in section "Cellular data network". To subscribers of "Beeline" should be entered in the APN field value internet.beeline.ru and in the field Login and Pass to enter the word beeline. The subscribers of "MTS" you only have to fill in the APN field inscribed in it internet.mts.ru. Well, if you use the services of "MegaFon", enter internet in the APN field, and in the fields Login and Pass enter McAfee. Restart iPhone that the phone was re-registered in the network. You can now open the browser. By default, it is located on the first (main) screen is a blue icon of a compass with the signature Safari. Hit it and after starting the browser, enter in the address bar, the website address that you would like to visit. Stretch the page on the screen with your fingers to zoom in. To move up the page, touch the top of the screen. As an alternative browser you can use the popular app is Opera mini, which can be downloaded free in the AppStore, the icon which appears by default on the main screen. Opera mini works a little faster than Safari, but does not support Multitouch. To increase page "tap" the screen with your finger twice. Re-action will return the page to its original form. If you are in range of a wireless network, when you try to connect to the Internet, the iPhone will notify you of available Wi-Fi network and offer to connect. Agree! So you will save money on their mobile account. 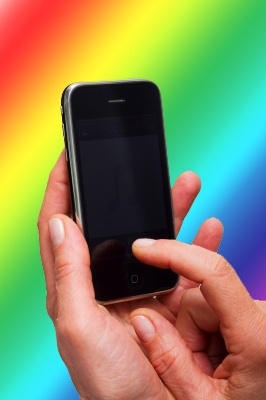 The IPhone 4S allows users to access the Internet using the technology of wireless data transmission. You can use both Wi-Fi and 3G, to implement the ability to view pages on the Internet. To access the Internet via Wi-Fi you can use the appropriate settings menu item. In this case additional manipulation on the configuration of the phone you produce not have to. To complete the connection, go to "Settings" - Wi-Fi. Move the slider right to activate the data transfer. Among the list proposed at the bottom of the screen, select the access point name that you want to use for the connection. If necessary, enter the required password. After you select a few seconds will be connected and you will be able to use the Internet. To connect to the network by wireless communication through the access point 3G mobile operator you will need to enter additional settings. If you are using iOS version 6, configuration settings, go to "Settings" - "General" - "Cellular data" - "Cellular data network". For devices iPhone 4s with iOS 7 the 3G is in "Settings" - "Cellular" - "Cellular data network". In the corresponding lines of the proposed options, enter the options you want. Under APN, enter the address of the access point, and enter the user name and password for the connection (if required). The appropriate settings you can find on the official website of your operator. You can also call the support service provider of mobile communication, to clarify the necessary parameters. For Beeline as APN, you need to specify home.beeline.ru or internet.beeline.ru. In the field "username" and "Password" enter beeline. To configure the Internet through a "Megaphone", just write the value of the internet in the APN field. To access via the "MTS" enter internet.mts.ru as APN. Username and password for the operator must be specified as mts. To solve the problem you can also contact the helpdesk of your mobile operator. After making settings go to previous menu and switch the slider to "Cellular data" is turned to the on position. If the settings were done correctly, on the top of the smartphone screen will appear the icon for EDGE or 3G. To access the Internet, use a browser which can be accessed via the corresponding icon on the screen. If you connect to the network fails, restart your phone and verify your information again.